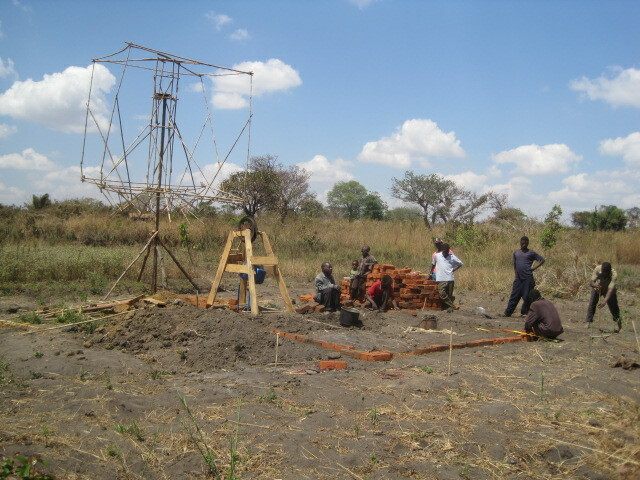 With successful tests under our belts, we have stepped up our work on the windmill irrigation scheme at Mziza. We have come up with a reservoir system that will act as a buffer between the pumping and delivery structures. Downsides to this system are: the capital cost of the reservoir (i.e. cement ain't cheap); evaporation will be greater in the reservoir than in the well; standing water attracts mosquitoes (and watering at dusk may put farmers at risk of malaria). There is not much that can be done to reduce capital costs because structural integrity should not be compromised. A crack in the floor of a house does not affect the utility of the house; whereas a crack in the reservoir floor is catastrophic. Every insurance must be made that the concrete will not crack. As for evaporation and mosquitoes, a simple covering over the reservoir will reduce these problems significantly.